Like Merchant Ships: It's time! 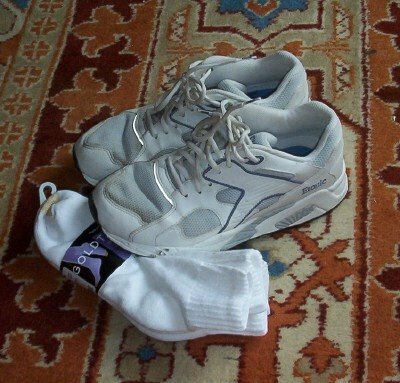 Time to pull on my 25 cent walking shoes, that is! Remember the embarassing thunder thigh episode, in which I vowed to throw away my stretchy pants at six weeks postpartum? Tomorrow is the day. I'm really excited! I can feel a commitment to my body I've never had before. I guess motherhood has matured me; past attempts at dieting seem half-hearted in comparison. Two online motivators deserve the credit--Barbara at Mommylife's five month transformation and The Incredible Shrinking Mom's challenge to Diet Naked. In this case, with online accountability. I'll be updating here as I get fit, with a frugal twist. Hopefully new socks (and skinny clothes!) will be my only investment! In retrospect, I can see that the root canal was a blessing in disguise. It forced me to leave the baby for over four hours--a feat that took me a year with our first child! Now, an hour in the Y's nursery won't be nearly as traumatic. At least, I'll be praying it won't! Here's my huge motivation for going to the gym. A shower uninterrupted by children and without the fear that my 2 year old will get into something (electrical outlets, poison, the great outdoors). Now my husband travels for work so this might be more motivation for me than others but 5 minutes of shower time along and I'm a new woman. I don't know what to say first... "Go Meredith!" or "25 cent walking shoes?!?". I think I'll go with "Go Meredith!" Good for you! My son (only child) is over two years old and I am just starting to work out now. However the cost of a gym with childcare is so outrageous($100 a month!!!) here (Sacramento, CA) that I've opted for Curves (less than $40 a month by prepaying the year contract) and working out at 6 am before my husband goes to work. Meredith - I've been following Barbara, too, and thinking...When I saw your post today I headed over to check out Mel and that was the final push I needed. Baby Jack is 6 months old and I'm actually heavier than I was after he was born! So I'm digging out my walking shoes with you! Just checked out the blog awards and you won a category! Thought that I'd whip across and say congratulations!!!! I love your blog and was chuffed to see that you won! And all the best for the weightloss - I've been following Barbara too and I should really get motivated too! Be careful of 25 cent walking shoes. If you start to really get into working out, you really do need to invest in a good pair of shoes made for your type of feet, high arch, normal arch, or flat. I am not saying that you have to pay 100 dollars for a pair of shoes, but take it from someone who bought "cheap" shoes, and is now paying the price - my knees and ankles are shot, and will never recover. (un)PerfectMother, I know you're right. But my budget is completely depleted due to the dental work, and I'm so glad I picked up these shoes when I saw them. They FEEL great! The seller bought them and wore them twice because she needed a larger size, not even scuffing the soles. I like them so much that whenever I do save up for the next pair of shoes, I will probably buy this brand again. Off Topic- but congratulations- You won the frugality category at Blogs of Beauty!!! I am so jazzed- because I voted for you.=) I get so many terrific ideas from you- thanks! More power to you!! Just remember in your endeavors to be healthy that you are required only to be faithful - it is God who grants us success. If you haven't checked it out yet, try SparkPeople. I've had so much success just tracking my food there (20lbs over the last two months), after a LOT of struggling after my daughter was born. Best part...it's free! Can't get more frugal than that! They have a pregnancy site, too, which I'm planning to use if I get pregnant again this fall. said old lady where ya going to? she said young punk who ya talking to? I'm instructor at the Airborne School! I could go on, but this is the cadence I like to mull in my head while have to walk! Thanks for your comment at my site--I'd checked yours out earlier, when voting for the Blogs of Beauty (and I did vote for yours--it's a great site!!). I just realized, when reading this post, that our babies are pretty close in age. Addison was 10 weeks this Monday; so I'm about a month further out, but am still struggling to lose the last 10 pounds. Having a 4 1/2 pound baby doesn't help;) Good luck with your crusade!